Michigan Child's Death Puts Spotlight On Clash Between Medicine And Religion In 34 states and the District of Columbia, there are religious exemptions that allow parents to forgo medical treatment for a child if it conflicts with their religious beliefs. In 34 states and the District of Columbia, there are religious exemptions to child neglect and abuse laws. That means a parent can deny a child medical care for reasons based on religion. The case of a Michigan couple charged in the death of their 10-month-old daughter is bringing to light a debate about withholding medical care because of religious beliefs. Seth Welch and his wife, Tatiana Fusari, both 27, were charged with felony murder and first-degree child abuse after their daughter, Mary, died earlier this month from malnutrition and dehydration, an autopsy revealed. The parents said they didn't seek medical help for their daughter because of their religious beliefs, though they declined to define their religion. "I believe I am being unfairly charged, being made an example of for my very strong faith," Welch told WOOD TV in Grand Rapids, Mich. "Going into the doctor's office these days is just about as dangerous as not going." Every state in the U.S. has laws protecting children from abuse and neglect, but in 34 states and the District of Columbia, there are religious exemptions that allow parents to forgo medical treatment for a child if it conflicts with their religious beliefs, according to a Pew Research Center analysis of data from the Department of Health and Human Services. There are also religious exemptions to manslaughter laws in at least six states, Pew reported. However, in many states, including Michigan, these exceptions are not absolute. The Michigan case, among others, is raising questions about whether these laws should be changed. 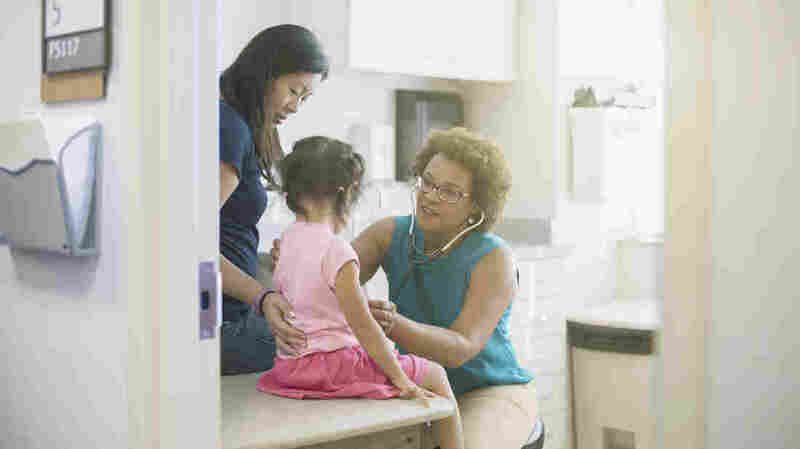 But sometimes it's difficult to protect both religious freedom and the health of a child, says Dr. Ray Barfield, a professor of pediatrics and Christian philosophy at Duke University. "There's going to be some things that are downright abuse that could be legally justified by saying, 'It's part of my religion,' " he tells Here & Now's Robin Young. "At the same time, the consequences of simply dismissing protection for a range of religious expressions is going to have some consequences that probably even the people who are arguing for that are not going to like." Some religious groups, including Christian Scientists and the Idaho-based Followers of Christ, either recommend or mandate faith-based healing instead of traditional medicine. In 2016, a state government task force concluded that five children in Idaho died three years earlier because their parents did not seek medical treatment for them due to their religious beliefs. Studies in the 1980s and '90s have also documented measles outbreaks and high mortality rates among Christian Scientists. Since Idaho enacted a faith-based healing exemption in the 1970s, child advocates estimate more than 180 children have died or were stillborn in families that practiced a religion that shuns modern medicine. Religious exemptions in civil and criminal child abuse laws are linked to the 1974 federal Child Abuse Prevention and Treatment Act, which was construed to mean that states were required to implement faith-based healing exceptions, according to Pew. That interpretation was later overturned, but by then states had already passed a handful of laws that included them. Christian Scientists and Followers of Christ aren't the only religious groups that reject traditional medical care. Jehovah's Witnesses will not receive blood transfusions, the Amish will not undergo heart transplants and sometimes heart surgery, and some groups of Hindus, Sikhs and Muslims do not allow the use of animal-based products when they receive medical treatment. Barfield says that many religious groups will turn down certain types of medical care because they believe the consequence is eternal damnation. "If you put eternal damnation against taking a flu shot, probably the flu shot's going to lose," he says. But Barfield says doctors shouldn't completely write off patients who object to medical care due to religious reasons. Duke's theology, medicine and culture program seeks to teach medical students how to understand how different religious beliefs can clash with medical care. "As physicians, we depend on families trusting us, but understanding that we're human," he says. "It seems to me that we could at least return the favor, and show them respect as they try to figure out the world in their own messy way — including religiously messy ways."